I have decided to host another swap. I have seen similar swaps in blogland and missed out on the signups. Here is the scoop. This swap is for vintage Sheet Fat quarters. 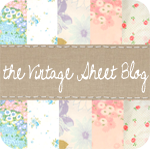 There are sooo many things you can do with vintage sheets, the ideas are endless. Sign ups start today and end on June 12th or when there are 50 participants. Send by date: From confirmation of sign ups through June 30th. I will then send out your fat quarters by July 10th. Sorry, just easier for me at this time at the end of my pregnancy. Leave a comment or send me an email to sign up. Please include: Your email address & your blog address. I will then send you an email confirmation with my address for mailing the fat quarters. After I have received all the FQ's I will then mix and match all the FQs and send the new bundles out. No new sheets- Vintage Please. Please try to make sure the sheets are in nice condition, no pilling or worn out sheets. I know that is a lot of rules, sorry! This swap is just a bit different. Feel free to use the above photo on your blog. Have fun hunting for sheets. I'm game! I was just googling for a vintage sheet swap after seeing others' goodies AND after going by the ones that are done and gone on google, I found yours! WooHoo! And I already have sheets in hand from a Salvation Army trip this weekend! All my info should be on my blogger profile. by the way, you might consider putting it on Sew Mama Sew's little announcements to drum up interest and get more swappers if it's slow to get them - of course I'm entering this pretty darn early. I'm jealous- you are way closer to having your baby than I am to having mine! :) Congrats on your soon to be baby girl! Oooh, this sounds interesting! I might have to give it a shot! I'm interested, but from Australia am I eligible to swap?. Thanks for your kind comment about Scout!! I am NOT signing up for the swap..I don't even know what fat quarter's are..fabric for quilting?? Have fun anyway with the swap. i'm sending you an email:) please count me in! ooh, i've sent you an e-mail! i'm super excited about this, yet another excuse to go buy more sheets! one thing i meant to ask and forgot - should each FQ be a different print? since you're divvying them up between the swappers, are duplicates okay? it'll be really interesting to see if people end up with the same prints, from other people. it's so fun to run across the same sheets all over the place! i've seen people craft with sheets i have as well, and have seen other people comment on the same thing. 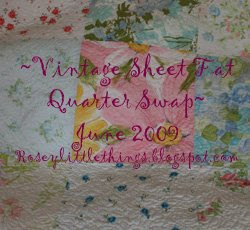 I would like to join the fat vintage sheet swap too! Do we have to verify the sheets are cotton? Any requirements on them being floral? Thanks for hosting! Hopefully it's not too much work for you at the end of your pregnancy!! I'm fairly certain I'll be joining the swap. I'll let you know for sure on monday... need to do some thrifting first! Hi there, stopping by via Sew Mama Sew, and I'd love to participate in the swap. My email is peht@rocketmail.com. Thanks! Yeah! I'm in too, just found a few new sheets at Goodwill today. Do you need to know a number we're each sending? Thanks for the swap! I would love to participate in your swap. I am just getting back into quilting and am excited about this. My info is also on my blogger profile. Count me in! Looking forward to this swap! My friend Paige told me about this and I'm so excited. I'd like to join. My e-mail is sewhappyjane at gmail dot com. omg i am really excited i found you! i'm working on a quilt made out of vintage sheets and am in need of more! i found you via missy's blog. i am so glad i got in on the deadline!! Definitely add me to the list!! Oh I hope it's not too late! I would love to be counted in. I keep missing out on these too and I have some GREAT vintage sheets I've been dying to dive into! Link to me. Grab the code below! Copyright 2007-2011. 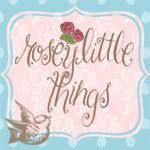 All photos, designs and artwork are the sole property of Jennifer Smith and Rosey Little Things. Please maintain integrity - copying, screen capturing or scanning is ILLEGAL. Please do not copy, reproduce, or use without written permission. Thank you.